I realize that Easter is still over 4 weeks away, but it's never too early to get started on little projects for the occasion. Last year my mother-in-law and I were at Target when we saw these cute little felt Easter bags in the dollar spot. I was so tempted to buy one for each of my kids but decided that I could make my own and it wouldn't even cost me a dollar per bag. So, I bought a little more felt and used some that I already had and when I finished I had two Eater bags for approximately $1.40. So, it's not a whole lot cheaper than the ones at Target but these are handmade with love AND personalized. Here's a tutorial for those of you out there who'd like to make your own Target knock-off Easter bag. Please know that I'm not a perfectionist nor do I really know that much about sewing, so take that into consideration while reading/following this tutorial. I took two pieces of 9x12 felt and cut off two inches from the shorter side, these will be your handles. Fold the handles in half and sew 1/4 inch from the edge (no need to turn under since felt does not fray). Then sew 1/4 in on the other side too, so you have two seams on the handle (the second seam just makes it look better, there's no real use for it). Cut a square off each bottom corner (I made 1 1/2 inch squares) and then stitch the bottoms together. This is what it will look like once you've sewn the bottom pieces together. Now turn the bag right side out and you're all set (for the most part). I like to make my bags a little studier so I find the corners and sew a seam all the way up from the corners. This makes the bag more rigid. Just make sure to back stitch at all ends since little kids will be playing with this. You want to make it as sturdy as possible. Next, add your handles. I just picked a place where I thought they looked good and stitched them on. I used a continuous stitch and made sure to back stitch at the beginning and the end. I also added a little "X" in the middle to make it look a little better. The trick that I've found for making handles go the right way is to hold the piece that is going to be the handle flat in front of you and then just drop your hands down towards each other and you should get your handles going the right way. Once the bag was finished I hand sewed on a little chick and an M on Micah's bag. I made a document with some bunnies (I used the white one for Naomi's bag) and a chick to copy and letters to trace for the bags. I just eyeballed the animals but cut out the letters and actually traced them onto the felt. Then it came time to get this on their Easter bags. First I sewed the eyes and beak onto the large yellow body, then I sewed the legs onto the bag followed by the wings and the little tuft at the top. Then I sewed the body on and before closing it all the way I added some poly-fill to make the bag pop! This project really didn't take me too long and it was great to work on while sitting outside watching the kids play and an easy project to do while watching TV (once the initial bag is sewn that is.) Let me know if something is not clear and I'll try to clarify. Don't feel like sewing your own? Leave me a message at my etsy store and I'd be glad to make one for you! These are so cute! I love the applique! The chick is so adorable! So adorable, wish I could sew! Thanks for the the great crafts! Really cute idea! I should make one for my grandson. Love it! I've never seen this. It looks really cute. So cute! Definitely making these for my kids! Stinkin' Cute...REALLY cute! Thanks for sharing! adorable! 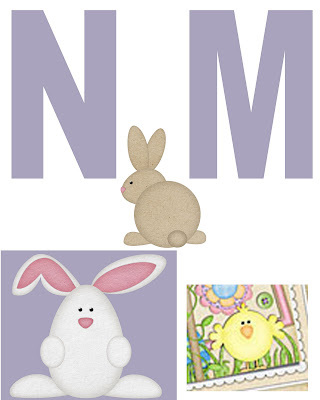 love that little chick applique! So cute. I made our own Easter bags this year. I made five for my boys and my niece and nephews.